Take this fort in the name of the Stormcloaks. Meet the men preparing for the attack. After finishing the previous quest and returning to Galmar Stone-Fist, he will ask you to meet the men preparing for an attack on Fort Sungard. Head over to the men just north of the fort, and when you reach them they will start running to the fort. Your journal will tell you to take over Fort Sungard by defeating the enemy, and it will keep track of the percentage of enemies left. Simply head up to the fort and assist the Stormcloak soldiers in defeating the Imperials. There are a few wooden barricades out the front of the fort—three hits from a weapon will destroy them. After you have taken the percentage of troops left to kill to zero, the quest will end and you will have to return to Ulfric Stormcloak for the next part of Liberation of Skyrim. 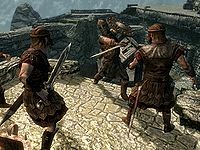 The Imperial soldiers will occasionally drop one of the Divines' amulets (excluding Talos). This quest, along with Compelling Tribute, may be skipped if you have completed Season Unending. This quest can be completed in the Imperial Legion quest-line if Markarth was handed over to the Stormcloaks during the peace treaty negotiations in Season Unending. If you approach Jarl Igmund, Raerek, or Faleen in the Blue Palace after this quest has been completed, they may attack you on sight. Since all three are essential, they cannot be killed. After the civil war has ended, they will revert back to their non-hostile behavior. ? 10 Galmar Stone-Fist has sent me to assist in taking Fort Sungard from the enemy. 9000 Finishes quest We have succeeded in taking Fort Sungard from the enemy.